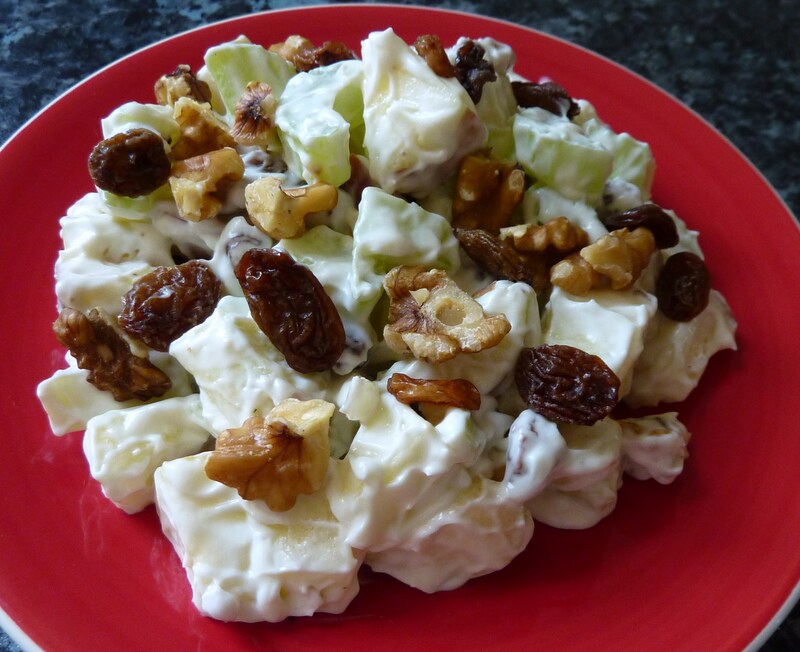 Hector’s Waldorf Salad is a combination of fresh raw apples, celery slices, broken walnuts and sultanas, mixed with good quality mayonnaise. I like it because it’s quick and easy to prepare, tastes fresh and crunchy and is a change from the quick sandwich I usually have for lunch. It tastes quite sweet which satisfies any post-lunch sugar cravings. It’s also a good way to use up the celery that sometimes arrives in our weekly organic veg box (I’m not a great fan of raw celery sticks) and the stray apple that always seems to linger too long in the fruit bowl and never gets eaten. The original Waldorf Salad was invented by the maitre d’ of the Waldorf Astoria hotel in New York, Oscar Tschirky, just after the hotel opened in 1893. He first made it for a supper held in the hotel for 1500 members of the city’s elite. The recipe was then published in 1896 in The Cook Book by Oscar of the Waldorf . It’s worth having a look at the book as it’s an interesting piece of culinary history. Waldorf Salad soon became very popular and other New York restaurants put it on their menus. Adding walnuts was the inspiration of George Rector of Rector’s (The Rector Cookbook, 1928). I put Waldorf Salad, as a starter, on the menu of Hector’s, a French flambé restaurant I co-owned with my partner, Chris, in Paphos in the early 1980’s. The restaurant was open in the evening for dinner. Most of the main courses and some of the desserts were prepared by the chef (Chris) in the dining room by the side of the customer’s table. He cooked each dish ‘on the lamp’ (in a shallow pan over a burner) then gave it the the final dramatic flourish. He would set the contents of the pan alight with alcohol, usually brandy, then like a magician, douse the dancing flames with cream. It was flamboyant and sometimes spectacular, especially when he used too much alcohol and the pan resembled a small towering inferno. But the whole experience never failed to please the customers – the individual attention and the hint of excitement. Everything was always under control and there were no major casualties just minor ones like the dessert I was flambéing one evening. Bananas, halved lenthways, soft and lightly coloured were lying in a sauce of golden caramel with a hint of brandy, waiting to be lifted onto the plate. They smelled wonderful. As I switched off the burner and turned to lift a dessert plate from the table , I brushed against the handle of the pan which crashed to the floor dispatching sticky bananas and hot caramel sauce on to the carpet. I could have wept. Make the dressing by mixing the mayonnaise and yoghurt together until smooth and creamy with no lumps. You may have to add a drop or two of cold water at this stage until it’s the consistency of thick double cream. Before you begin, reserve a few walnut pieces and sultanas for garnish. In a bowl, mix the apples, celery, walnuts and sultanas. Add the dressing and a sqeeze of lemon juice. Add more lemon juice, if needed. Sprinkle the walnuts and sultanas over the salad and serve on small plates either as it is or with a few crisp lettuce leaves.